16 Piano Jazz & Standard Tunes specially selected (out of 800 songs) that contain "You" in their titles. 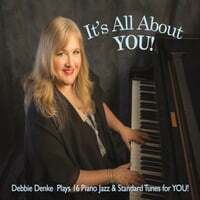 More than just a joyous listening experience, Debbie Denke's album is also a party game & contest! It's All About YOU! began when I was debating what tunes to play for an intimate home piano concert. As I glanced over at my piano I noticed about 3 tunes which had the word "You" in their titles, and a theme was born! After a fast 40 'YOU-tunes' came to mind I asked family, piano students and musician friends, including those in a Facebook group called, "The Jazz World", to contribute additional tunes with "You" in the title: A contest was held for the most new titles, and we ended up with over 800 tunes! The 16 'chosen ones' are wonderful tunes from an era of rich songwriting which also were very fun for me to play and improvise upon solo piano style. The concert played out as a game of giving a short clue for each tune before performing the number, a pencil/paper to each guest to write down titles 1-15, (#16 It Had To Be You is a sing-a-long with a lyric sheet). A prize was awarded to the winner of the most correct guesses. On the album there is a link to find out all about the contest and how to play the game with your own guests. People often wonder what goes on in a jazz musician's mind during improvisation. Even though these tunes are performed solo piano style, the lyrics played an important part inside my head and out of my fingers. I feel each of these songs has a wonderful melody to bounce off of, inspirational harmony to play around with, and clever lyrics by some of the greatest teams of composers and songwriters in history. I encourage you to check out complete lyrics to these timeless tunes!